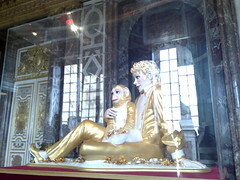 There really isn’t a good way to introduce or describe the Palace of Versailles. You’ve probably seen it either in person or in pictures, and if not, there aren’t very many words that can be used to describe the place. 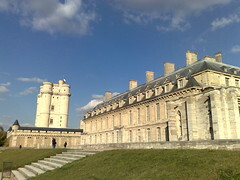 It was originally built by Louis XIII as a hunting lodge. When Louis XIV wanted somewhere to escape the rabble of the Paris mobs, he turned the modest château into a palace of fantastically colossal scale. It’s hardly believable to walk around the place, to imagine the wealth, the power, and the hubris of the person who conceived it, the same hubris that would eventually bring down the entire monarchy. 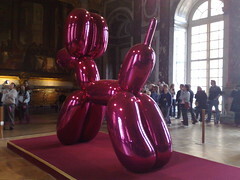 I missed the Jeff Koons exhibit at Chicago’s Museum of Contemporary Art, so I was excited to see his work at Versailles. To many people, reading French wine labels is like, well, reading French. They aren’t nearly as cut and dry as wine labels from the US or other newer wine-producing regions like Australia or Chile. To the French, the most important component of wine is not the grape but the terrior, a concept that loosely translates to the soil but encompasses also the climate, the topology, and sometimes even the people and the circumstances under which the wine was made. So on a French label it’s most important not to look for the grape but where the wine was made. For that one looks for the words Appellation d’Origine Contrôlée. From there, you get the region, or perhaps even the town, where the grapes were grown and where the wine was made: the terrior. Of course, to make any sense of the AOC you just have to learn which appellations are where in France, what are the major grapes in that region, and so on. To make matters worse, there are over 300 distinct appellations d’origine contrôlées. So just when I think I’ve come to terms with navigating the French wine label, last night’s wine threw me a curve ball. Instead of saying Appellation d’Origine Contrôlée, it said something different: Appellation d’Origine Vin Délimité de Qualité Supérieure. I’d never seen this before. Has my knowledge of French wine labels been even more incomplete than I had previously even thought? It turns out, of course, that it was. A quick Google search reveals that Vin Délimité de Qualité Supérieure, or VDQS, is a classification just under the AOC. It’s an oenological purgatory that some wines are forced to stay in as they make their ascent from Vin de pays status all the way up to full AOC status. And much like the Catholic limbo, it’s a distinction whose time is at an end. The French parliament has abolished this classification, with the last wines labeled VDQS set to be released in 2011. The wine we had last night was delicious, so let’s hope they make it to AOC status. Meanwhile, I’ll continue trying to fill in my knowledge of French wine labels, one glass at a time. At last, my arm is complete again. Misty and I have been on a sustainable seafood kick for a while; living in the Pacific Northwest makes us susceptible to all things green, and when we hear about all kinds of fisheries on the decline, it makes us want to do our part. Inspired by Clotilde’s recent post, we wandered over to the market on Boulevard de Richard Lenoir to pick up some mussels. I’ve always had a fondness for the tasty bivalves, and when I learned that these particular mussels had their own appellation, I was eager to try them. They turned out well, I think. They are a lot smaller than the mussels we get in the Northwest, but a lot cleaner. Their beard was more of a soul patch. 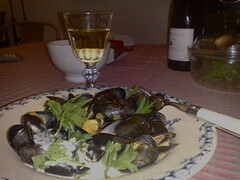 While they are still in season I might make them again and add a bit of fennel or some Pastis instead of saffron. Of course, there are plenty of other fish in the sea and at the poissoniere markets. This is our first day of cold and rain in Paris, the streets are wet, the sidewalk poubelles are filled with broken umbrellas, and you can’t tell the mud from the dog doo. On the way to the covered Market at Place d’Aligre, I was delighted to find the fresh farmers market open. There were no lines and the produce sellers spoke English so I didn’t have to wait 10 minutes while someone yelled at me in French. In fact, at this market, you’re allowed to pick and bag your own produce! Once all your ingredients are together again in your soup pot, add some dried spice if you like. I chose paprika, white pepper, and sea salt. Then add a dollop of crème fraise, yogart, or heavy cream when you serve and sprikle with some thyme for garnish. 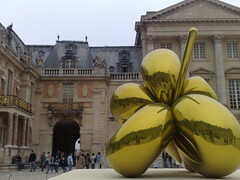 What better way would a Parisian spend the lovely weekend than going out to the one of the two parks bordering the city. On the west side, there is the Bois de Boulogne, and on the east there is the Bois de Vincennes. 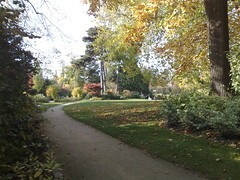 We chose the Bois de Vincennes because we intended to visit the zoo there. However, time got the better of us, so we’ll have to save the animals for another day. Then you can get a sense of how large this place actually is. The carte orange has been phased out in Paris for the Navigo. But without a certificate making our residence here official we aren’t able to get a monthly or yearly Navigo pass. We have to buy Navigo Découvertes which are good for a week. Come on, really? Really? It hardly seems fair. On another note we now have phones so we can go texto crazy on eachother and I may have found a nice French school in our neighborhood! After reading about an expat’s experience at the big Alliance Francaise on her blog, I’m hesitant to go there. It’s Paris so all of these things should be magical, n’est pas? Non.Â C’est un grande ville which means it’s crowded and people are generally, shall we say, “not interested”? Moving, going, crossing, smoking, talking. It’s all verbs here. I find shopping stressful in Seattle, stressful in New York, stressful in Istanbul. How can one enjoy this sport? Luckily, there is one depot vente (consignment store) near our place 37 rue Faidherbe and others in Montparnasse like Chercheminippes which has designer everything galore. Paris is expensive, even used clothing is expensive, but it is easier to find cool designer clothes here than in Seattle. I’ll still miss Take Two, though. Eating is more stressful for me than for Paul, of course. We’ve tried a handful of bistrots. I can’t really get around these fixed menus and les serveurs are not falling over themselves to help you. They’re nice enough and quickly switch to English but the menus are tiny – there isn’t a lot a freak like me can do. How can one survive France without garlic, onion, or shallot? I think I’m going to have a perpetual stomach ache. At least there’s lots of wine! Like the wonderful wine shop on rue Paul Bert, Crus et Découvertes. The owner is dreamy, I loved hearing the fluid streams of french from his lips, I understood maybe two words. One was carafe. “Carafe? Oui.” It’s hard not speaking the language, folks. As for walking the streets, well, that’s been our daily routine. .
It’s been such a nice day out I decided to go on a quick walk around town. It’s been our third day in Paris and I haven’t even seen the Eiffel Tower yet, so I figure I should leave the residential confines of the 11th arrondissement and see some of the more touristed streets. I set out walking down rue du Faubourg St. Antoine, a large street populated mostly by discount clothing stores. From there I crossed Place de la Bastille. As you might guess, Place de la Bastille is the former site of the infamous prison, where angry mobs made their way up the rue du Faubourg St. Antoine and stormed the place, eventually bringing down the French monarchy. Now it’s little more than a huge traffic circle and home to the Opéra Bastille. From there I went along the cramped, tourist-lined streets of Le Marais. It’s named after the swamp that was drained to make the neighborhood, and now home to the city’s hot nightlife and gay culture. Oh, and also Orthodox Jews on the rue des Rosiers. I wandered into the Place des Vosges, the oldest public park in Paris. In my opinion, it’s one of the prettiest places in this city, particularly on a nice autumn day like today. I decided I’d like to take a picture to show everyone. Here’s where this post became sans photos. My phone’s camera decided to stop working. This is the second time it’s happened, so perhaps I’ll start looking for a new phone with a properly working camera. In any case, feel free to look at the Wikipedia page photos, and imagine the park full of Parisians and tourists enjoying the park and the weather. Or, if you prefer, imagine Ernest Hemingway shooting pigeons for food, which is something he liked to do when he lived here. Next came the Rue de Rivoli, a quick jaunt past the Hôtel de Ville, and finally the banks of the Seine. At that point I decided the number of people were getting the better of me, and I headed into the Metro and back to home. I never did see the Eiffel Tower. Hunger won out over exhaustion and we managed to stumble into a local café. Misty had un hamburger, mainly because we didn’t realize it had become so difficult to find a ham sandwich in Paris these days. I had a filet of a fish whose French name I didn’t recognize, but which turned out to be pollock. Washing those down with some wine, we went back to the apartment and had a nap. It’s about 9:30 in the evening here: a little after dinner time. The cars are driving by on the street and Jamie Oliver is in French translation on the television. So far, I’m surprised as how comfortable I’ve been this entire day. The months of language preparation seem to be bearing fruit. We’ll see how the coming days treat us. Of course this isn’t Paris — and to be honest it’s a bit odd to be walking here, in Arlington Heights, Illinois, days before we’re set to leave American shores for the continental hubbub of Paris. Just a few days before we were in downtown Chicago. Days before that I was in Seattle, petting our rabbits and teaching our friend and housesitter to give our rabbits their medicine. It’s been a lot of change, mostly taken in stride, counting the days until our flight takes off. We’re all packed and ready, so mostly we’re just working, relaxing, and spending time with family. We’re both very excited. I expect the days after our arrival to be filled with frantic trips to buy things we forgot and to get things set up for our three month sojourn. Until that time comes, I’m enjoying the sun. You are currently browsing the Sans Lapins blog archives for October, 2008.